Phillip Cohen, founder and CEO of Cohen Architectural Woodworking in St. James, Missouri, is the U.S. Small Business Administration’s 2017 Small Business Person of the Year for Missouri. And savvy businessman who began woodworking as therapy and turned it into a 75-employee, 54,000 square foot state-of-the-art facility in St. James, with a branch office in Lenexa, Kansas, that can accommodate large-scale and multi-unit rollouts. Projected sales are in the $14 million range. The firm moved to a 2,800 square foot facility in Kentucky in the mid-90s, then to a larger facility in Summersville, Mo., about 40 miles north of West Plains, in the late 90s. In 2004, the company built and moved into a 12,000 square foot facility in Saint James, later adding 9,000 square feet to the existing building, and setting up the branch office in Lenexa. In 2016, the firm added another 33,250 square foot expansion, bringing the total square footage to an impressive 54,250 square feet. Cohen has been a University of Missouri Extension Business Development Program (BDP) client since 2006, aided chiefly by the Missouri Small Business & Technology Development Centers (MO SBTDC), a BDP program that provides business analysis, consultation, access to technology and training seminars on a variety of topics. Over the years, the MO SBTDC has helped the firm with issues ranging from accounting procedures and lean manufacturing to business plans. Travin Shelton, business development specialist at the Missouri University of Science & Technology SBTDC in Rolla, was instrumental in putting together a business plan for a low-interest loan to fuel the firm’s 2016 expansion. 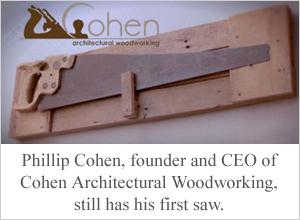 To learn more about Cohen Architectural Woodworking, LLC, visit cohenwoodworking.com. To learn more about the Missouri SBTDC, visit missouribusiness.net.